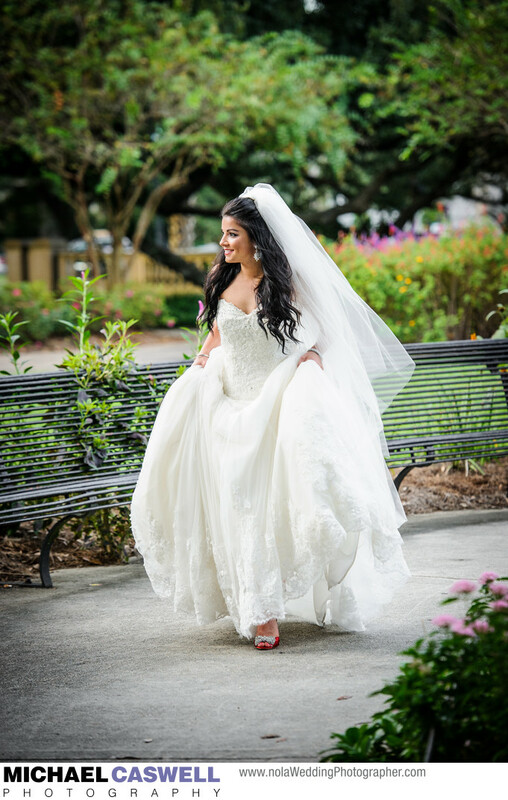 Audubon Park was the setting for this gorgeous bride's bridal portrait session. The use of a long telephoto lens with a wide aperture makes the background melt away and really makes her stand out, while her shoes peeking out from under the dress give just a tiny splash of red. The light was perfect at this time of day (late afternoon). While it's always a good idea to have a plan on where we will be shooting, it's also an unavoidable fact that sometimes the best plans are disrupted by unexpected factors outside of our control. We had originally intended to shoot by the Newman Bandstand in Audubon Park, but when we arrived, this area was unexpectedly in use by a large charity event, making it impractical to photograph there, so we had to improvise and move to another location in the park. And it worked out great! In this series of photographs, I asked her to simply walk along this curved walkway as she held her dress up, but specifically requested that she not look at the camera. Though a traditional bridal portrait is usually at least somewhat carefully posed, I enjoy capturing some more candid-like mostly unposed images during the session as well, as these images will tend to show the bride's individual personality more.